At Compassion It, we encourage schools and parents to introduce compassion to prevent and curb bullying. Want to bring Compassion It to your school? Our reversible wristbands are an easy and tangible tool that make compassion a priority. Point out acts of compassion you witness, and ask your students to flip their wristbands! 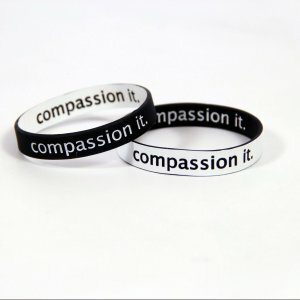 Compassion It is a nonprofit and global movement whose mission is to inspire daily compassionate actions and attitudes. We envision a world where compassion is practiced by every person, for every person, on every day. Learn more about us. Our wristbands are creating compassionate actions around the world, and you can find Compassion It in six continents, more than 50 countries and all 50 US States. Educators around the globe use our wristbands and lessons to make compassion a priority in their classrooms. By celebrating the acts of compassion they witness, these educators and parents are creating compassionate school cultures. We believe the antidote to bullying is compassion, and we believe compassion should be a priority in schools.